Boss for the upper cover of a book binding or cumdach (book shrine) for an Irish or Insular MS.
Boss in bronze gilt and blue colour studs, Ireland, 7th-9th c, 1 boss diameter 4,8 cm, height 0,5 cm with powerful ornate swirling motifs typical of Insular art, comparable to the roundels of the carpet page f 3v. of the Book of Durrow. 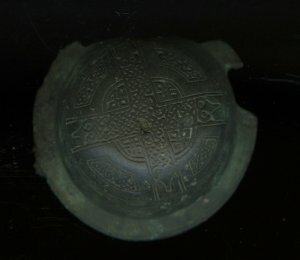 Remains of iron fitting for a later Viking re-use as a brooch. The original jewelled treasure bindings as well as the cumdachs of the Book of Kells and most other Irish or Insular Gospel MSS are lacking, ripped off during Viking raids on the monasteries, the metalwork and the jewellery given to Viking women, mounted as brooches with iron needles. 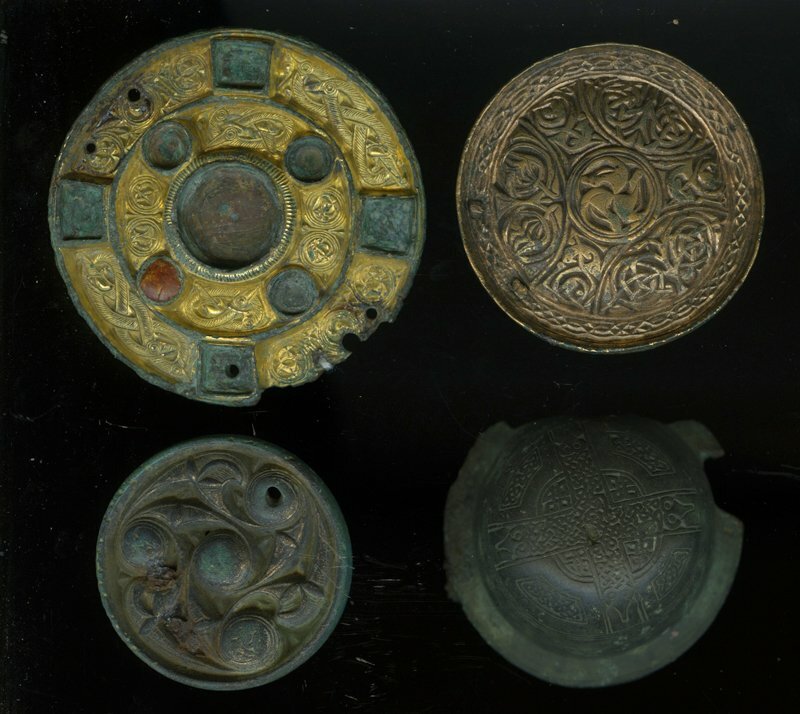 Part of a hoard of 78 Viking and Irish iron and bronze items found at Vang 1900-1901, presented by the Schøyen Collection to the library of Oslo katedralskole 2016. Provenance	 Monastery in Ireland or North England (ca 650-850); 2. Taken by a Norwegian viking, given to his woman in Vang, Oppdal, Sør Trøndelag (ca 850-950) and buried with her on the vast Vang burial ground; 3. Excavated by farmer in Vang (1900-1901) and with his heirs (-1993); 4. Knut Erik Bergan, Oslo, acquired March 1993; 5. Gift from the Schøyen Collection to the library of Oslo katedralskole October 2016.